CGS Learning launched a survey to assess the trends, challenges, best practices and priorities that will impact L&D teams in 2017. In analyzing the results, we are finding that a new trend is emerging. Over 47% of survey respondents state that they are preparing for the role of L&D to change within their organizations this year. What exactly does this mean? And, what is driving this change? 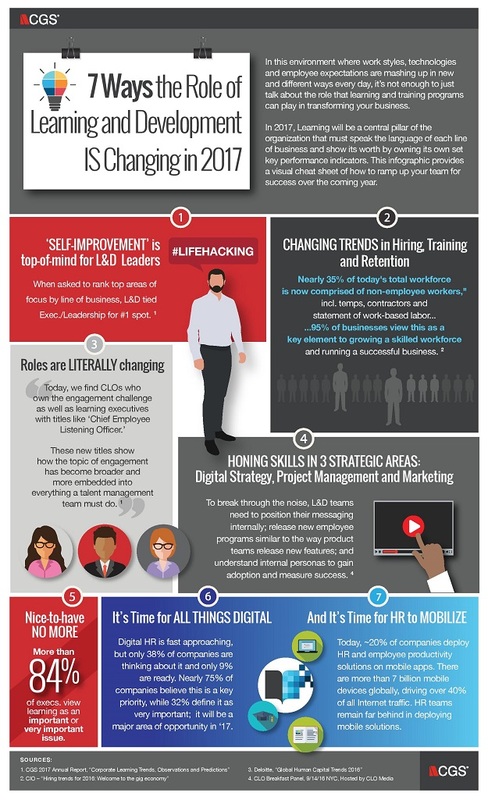 Check out our newly released infographic, 7 Ways the Role of Learning and Development Is Changing in 2017 for a visual breakdown of where Learning and Development is heading, what skills will be essential and how technology will play out this year and beyond.